Gavriel Noach Holtzberg (1979-2008) was born in Kiryat Malachi, Israel to a Chabad family, and grew up in Crown Heights, New York. A young prodigy with a prolific memory, Holtzberg had memorized an entire order of Mishnah word-for-word (a total of 681 passages in 88 chapters). He was a two-time champion in Mishnah competitions, and placed second in an international Talmud competition. He studied to be a rabbi and mohel in New York and Argentina, while doing community service through Chabad in Thailand and China. 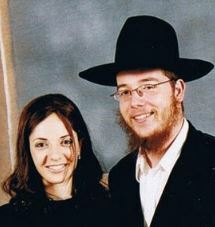 Holtzberg married Rivka Rosenberg (1980-2008) of Afula, Israel in 2002. A year later, the young couple moved to Mumbai, India to open a Chabad House of their own. Mumbai had a Jewish community numbering several thousand, along with countless Israeli tourists. The Holtzbergs provided vital Jewish services, including kosher food, a mikveh, and a place to pray, with Rabbi Gabi shechting his own chickens, officiating at Jewish weddings, and performing brit milahs. The couple would regularly host thirty or more people for meals every Shabbat. They also oversaw the conversion of a number of Indians to Judaism (including former Jew of the Week Sarah Avraham). The Holtzbergs were so popular that by 2006 they had raised enough money to purchase a six-story building known as the Nariman House. This became known as Mumbai’s “Jewish headquarters”, and in addition to being a synagogue and a Chabad House, also provided aid for the poor and ran a drug addiction clinic. During this time, the Holtzbergs suffered the loss of two of their three children who succumbed to Tay-Sachs disease. Then came the worst of tragedies: exactly ten years ago, on the 26th of November, the Holtzbergs’ Chabad House was attacked by Muslim terrorists who had descended upon multiple key targets in Mumbai. The couple was taken hostage, and were murdered the following morning, along with four of their guests. (A total of 164 people were killed in the Mumbai attacks.) It was later revealed that Rivki was five months pregnant. The Holtzbergs’ two-year old son Moshe was saved by his Indian nanny, Sandra Samuel. Five years ago, a new rabbinical couple was sent to Mumbai to continue the holy work of the Holtzbergs, and the Chabad House has now been rebuilt. The centre continues to grow, and now runs a nursery and Jewish school, too. A second Chabad couple is on its way to help. Among other things, the Chabad House is currently working to construct a rooftop memorial for all 164 victims of the attack. Moshe Holtzberg will have his Bar Mitzvah at the House next year. 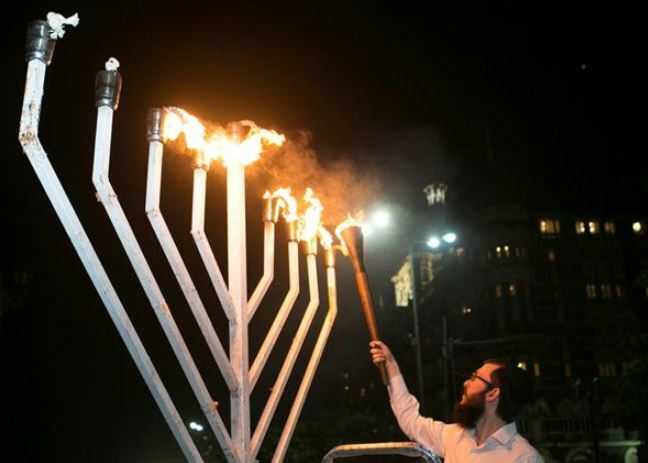 Chabad’s new Mumbai emissary, Rabbi Kozlovsky, lights the city’s Chanukah menorah. This entry was posted in Religious Leaders and tagged Bombay, Chabad, Chabad House, Crown Heights, Hasidic Jews, India, Israelis, Kiddush Hashem, Mohel, Mumbai, Mumbai Terror Attacks, Nariman House, Orthodox Jews, Rabbi on November 26, 2018 by Jew of the Week. Nili Block was born in Baltimore, Maryland and made aliyah to Israel with her family when she was just 2 years old. At age 10, she joined her mother in Thai boxing classes. By 18, she won the KickBox World Cup in Hungary, a gold medal at the world kickboxing championship in Bangkok, and a European championship title, too. Block trains alongside Sarah Avraham, who also won the world championship in her division in Bangkok. Like Block, Avraham made aliyah with her family to Israel, hailing from India. Avraham was born in Mumbai to a Christian mother and a Hindi father who were both drawn to Judaism for many years and eventually converted. (They began the process with Rabbi Gavriel and Rebbetzin Rivka Holtzberg – who were tragically gunned down at their Chabad House in the 2008 Mumbai terror attack.) Block and Avraham are the same age, and are both coached by Eddie Yusupov. The former is now a soldier in the Israeli Defense Forces, while the latter is doing her part in Israel’s National Service. They are both Torah-observant Jews, keeping kosher and Shabbat even on their boxing tours. The two world champions hope to compete in the 2016 Olympics Games, if kickboxing will finally be included as an Olympic sport. Just as it is incumbent upon every Jew to put on tefillin every day, so is there an unequivocal duty which rests upon every individual, from the greatest scholar to the most simple of folk, to set aside a half-hour each day in which to think about the education of his children. This entry was posted in World of Sport and tagged Aliyah, American Jews, Baltimore, Bangkok, Chabad, Convert, Hungary, IDF, India, Indian Jews, Israel, Israelis, Kickboxing, Maryland, Muay Thai, Mumbai, National Service, Olympics, Orthodox Jews, Thailand, Torah on March 5, 2014 by Jew of the Week.